Biodiversity and ecology are founded in evolutionary science. In order to understand why species of organisms occupy different parts of the world, it is important to comprehend how they evolved. Encyclopedia of Biodiversity examines this evolutionary framework with the help of more than 150 cross-referenced entries and five essays averaging at least 2,000 words each. High school teachers can use these entries—grouped by topic—to meet many of the science education goals established by the National Academy of Sciences. 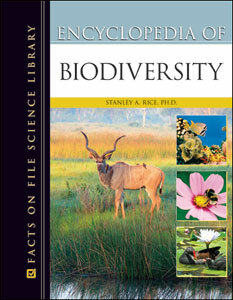 Written by a leading expert in the field, this comprehensive, full-color encyclopedia makes information about groups of organisms (from bacteria to mammals) and about ecological concepts and processes (such as biogeography and ecological succession) clearly and readily available to students and the general public. Tables at the end of each entry have a consistent structure, allowing readers to see how environmental conditions and biodiversity have changed through evolutionary time.